Winter is the time for skiing, building snowmen, having snowflakes land in your mouth and of course ice skating on frozen lakes. Here in mid-Sweden where I live, around the end of December temperatures drop to -15°C and all the lakes freeze up. The same lakes where I go swimming and paddle boarding in the summer, in January are rock solid and perfect for wintertime sports like ice skating, cross country skiing and ice fishing. The thing about Sweden is that no matter the season, you are always supposed to be out there enjoying the great outdoors. Rigid winters should be no exception. Winter-time outdoors activities to enjoy in Sweden, we said. On ice. I am not one who has accomplished a lot, I must admit. I tried cross country skiing, once. It was a long time ago when I was living in Norway as an exchange student. Why skiing on lakes you may ask? During the winter lakes cover up in snow and prove some of the finest places for cross-country skiing. They’re basically a huge snowy flat. I have never tried ice fishing, but it’s something I have promised myself I will try one day. We always go fishing in the summer when my dad is here. Ice fishing is a totally different business, but it’s something I want to try. Ice skating is definitely my favourite, something I do at least once a year. I was not raised with much sports, but my parents did take me ice skating every winter. I am from the Alps and I don’t come from a family with a skiing tradition, but at least I had a little taste of ice skating growing up. But we would always go skating on artificial surfaces. It was not until I moved to Oslo that I set foot on a frozen lake. A frozen lake at the beginning of the season (black ice). At the very beginning of the winter, it is usually the cold that comes first and then the snow follows. The very first weeks when the lakes freeze up they are all clear of snow. This is when they are at their most majestic, in my opinion. Flat hard surfaces of perfect ice. The ice at this stage is known as black ice. The water on the surface freezes trapping very little air in the process, creating a transparent layer of ice that allows you to see through. The water in the lakes is usually very dark, hence the name of black ice. They are quite spectacular, as with the right light you even get to see some fine reflections on the ice. See the northern lights reflected on a frozen lake. Through the winter the appearance of the ice will change. When the snow comes, it will cover the whole surface of the ice, turning the frozen lake into a snow flat. The snow is responsible for changing the quality and colour of the ice further on. When half-melted slush re-freezes, it usually contains much more air than when it is a compact body of water that freeze up. Hence the formation of snow ice, that is white as it has much more air in. Given the smoother texture, black ice is ideal for ice skating. This is a frozen lake with a very thin layer of fresh snow. Is ice skating on frozen lakes safe? Ice skating on frozen lakes is generally a safe activity to do. Many lakeside resorts have ice skate rentals during the winter, and carry out regular maintenance of the skating tracks. Since in Sweden during the winter snow falls pretty heavily, ice skating tracks are regularly ploughed to clear the passage from fresh snow piling up. This procedure is usually done on quad bikes with snow ploughs attached to the front. Security patrolling on snow mobiles is another feature done to check the quality of the ice around the beaten tracks. The thickness of the ice can measure up to a half metre. On such conditions it is even safe to drive a car on a frozen lake. trust your gut – experienced skaters can hear if the ice is not safe by the sound it makes. I am no experienced skater, but I did hear a suspicious noise once when skating at the beginning of the season, and I quickly turned around and moved back to where it was safe. When can you go ice skating in Sweden? At the beginning of the season not all lakes may be safe to skate on. Usually around January most lakes in Dalarna are thick enough to allow ice skating. If you want to go ice skating on frozen lakes in Sweden I recommend playing safe and planning to go in January or February. December might be too early; depending on the location of the lake and depth of the ice, some lakes might not have yet formed a thick enough ice layer to be able to skate on. This is usually a great time for photography of frozen lakes, as there is little to no snow around and the shiny black ice is at its finest. If you want to skate at that time you need to be well informed or head much more north than Dalarna. Winter in Dalarna generally lasts from mid-November until mid-March. Since I moved here I have experienced one very late winter (no snow until the end of December, when I took these portraits in the forest), as well as a very short one (it had stopped snowing by March). Unless you visit on an exceptional year, you can expect snow as early as November and as late as April. As much as it can be safe to ice skate in March, usually the quality of the ice is much worse than in January or February. Temperatures start going over zero during the day, creating a lot of slush, which re-freezes every night making for uneven skating surfaces. January and February are when ice skating conditions in Dalarna are best. There are plenty of places to go ice skating in the county of Dalarna. The gorgeous Lake Siljan in the north provides many opportunities, with prepared tracks in various locations around the lake (more information on skating on lake Siljan here, in Swedish). I live just minutes away from Lake Runn, located between the cities of Falun and Borlänge, and that is my lake of choice. This lake has also several prepared tracks with starting points at various locations around the lake (more information on skating on lake Runn here, in Swedish). We generally go to a very popular spot: Främby Udde Resort. It is the starting point of some fine prepared tracks; they have a rental service (you can also rent ice awls, just in case) and a restaurant to enjoy a warm meal or hot chocolate after spending the day skating. This resort is also a camping site. You can park your motor-home or rent a lakeside cottage if you want to stay a little longer and enjoy a winter vacation in the heart of Dalarna. The place hit the news last winter when the BBC featured an employee of the said resort who lives on the other side of the lake and who commutes to work skating across the lake every day. You can read the whole story here. My number one advice is: dress warm! Whenever I go ice skating on frozen lakes I like to wear my skiing pants and jacket. I usually have thermals underneath and woollen socks. While ice skating you can get quite some speed and the air in the winter is very cold. Therefore I also prefer leather skiing gloves, as they provide better insulation against the cold. Generally speaking, anything that is woollen against the body and waterproof on the outside is a good combination. Eventhough falling on ice you don’t get soaking wet, chances are you will still not be very dry. A helmet is a wise choice, especially for first-time skaters. If choosing not to wear a helmet, make sure to wear a hat to keep your head and ears warm. Another important accessory is a pair of sunglasses. The glare of the snow on a sunny day is really blinding, plus sunglasses protect your eyes from the cold air while skating. The cold air can dry up your skin very fast, so if you’re sensitive make sure to use a facial cream. Places like Främby Udde resort offer ice skating rental services. The skates you can rent have long blades and are designed for skating on lakes. They usually come with skating poles (optional). Access to the lake from the resort is not restricted and the tracks are open to the public. This means that you don’t need to pay an entrance fee or rent the skates from them in order to go ice skating. I have my own skates and I usually go with these. My skates are an old pair of figure skates that belonged to my mom. I took them to Sweden when I moved here as I knew I would have plenty of occasions to use them. They are not as stable as those with longer blades, but they do the job. From my own experience I can tell that while it’s fun to use skating poles on longer blades, figure skates are no match for skating poles. If you want to pack light, you’re pretty much good to go. Optionally, you can take a small backpack. I found it useful once when I realized I was starting to sweat. It was a cold day and I had worn one layer too much. Having a place to store it was a relief. Ice skating is a decent workout, so do not overdress or you’ll need to remove layers while out on the lake. When I bring a backpack I usually like to also take a thermos filled with hot tea to drink on the lake. And a chocolate bar, because you need some energy. 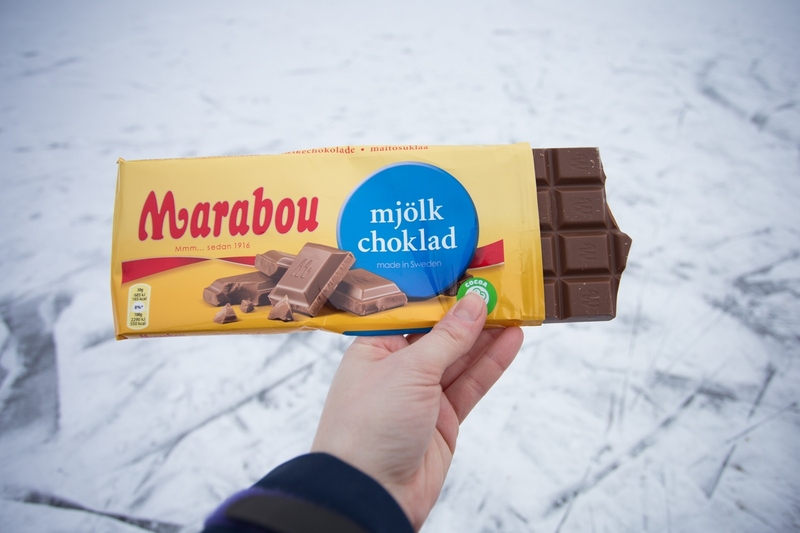 Even when I go light and do not carry a backpack you can be sure I have my dose of Marabou milk chocolate in the pocket of my jacket! No outdoor adventure is complete without some chocolate to reward yourself while out on the lake. Eating in the middle of a lake is not something one gets to do very often! Ice skating on frozen lakes is such a popular activity among the locals here, but it is somewhat overlooked by tourists. Yet, it is such a fun winter activity that basically requires no previous training. A perfect way to stay in touch with nature and appreciate the beauty of an open landscape. So if you happen to visit Sweden in the middle of winter don’t let the dark and the cold put you down and get out there! The Swedish nature is one great place to have a lot of fun all year round. Just don’t forget your chocolate!